We were traipsing around the city with our good friends and found ourselves cold and with a little time to kill. I knew exactly where we needed to go. I've come to love City Bakery for their pastries, especially their Pretzel Croissant, but I had yet to try their famous Hot Chocolate. Boy were we not disappointed. Instead of drinking, we savored them slowly with spoons since they are too rich to just gulp down. The homemade marshmallows are soft and sweet, a perfect pillowy topper to the melted chocolate bars underneath. I would definitely recommend splitting since they are so rich (trust us, The Mr chugged his before we left and regretted it). 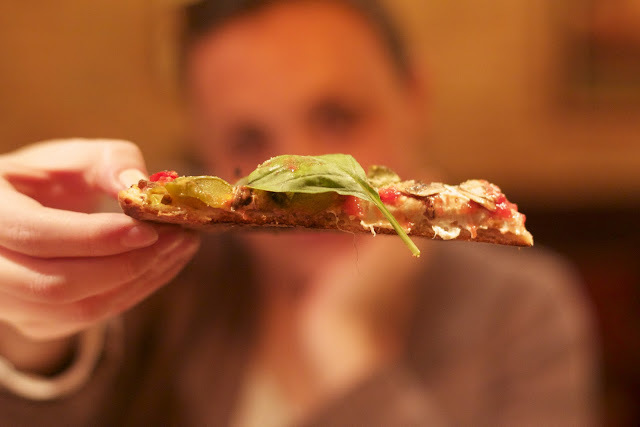 We were invited to come and try out Plum Pizzeria & Bar, which opened last August. We were welcomed warmly by Alex Alexopolous Co-Owner, Executive Chef, and Wine Director. As you may have guessed from his name, he hails from Greece and so does his partner-in-pizza, Adonis Nikoloulis. So why Italian? 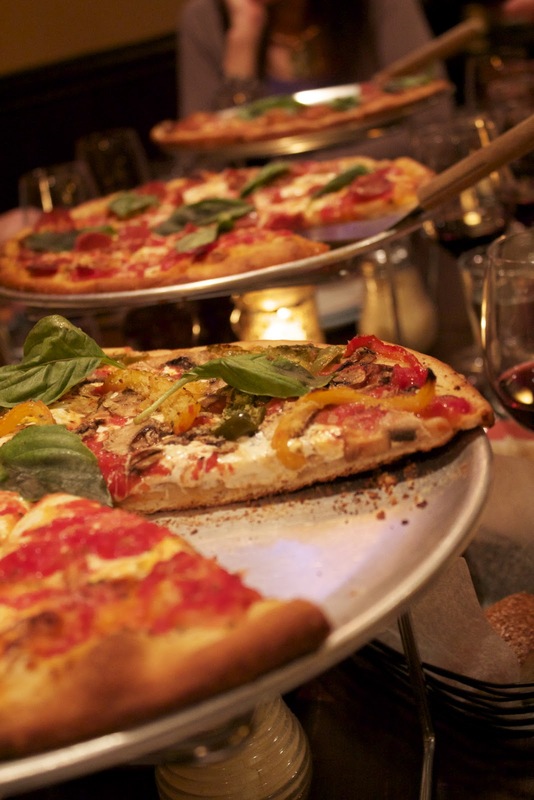 Well, their experience working at Patsy's in The Village and their passion for Italian wine drew them towards taking what they knew about pizza and improving on it. 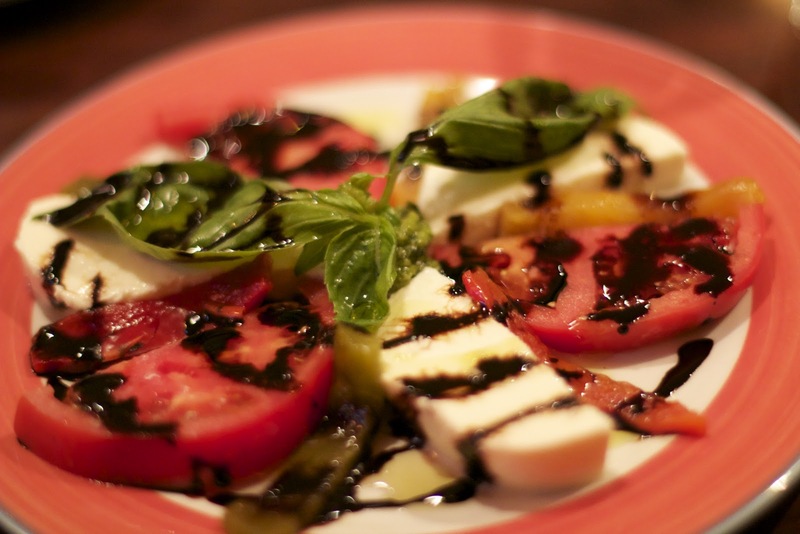 They make everything they can fresh, in house, including all the sauces, mozzarella, pepperoni, and pasta. Home made mozzarella, impossibly fresh tomatoes, freshly roasted peppers, house made pesto, a balsamic reduction, and extra virgin olive oil make such a fresh caprese salad that you'd swear it was summer. 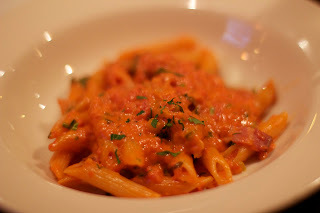 The bacon added an intense smokey flavor to this house made traditional tomato cream sauce. 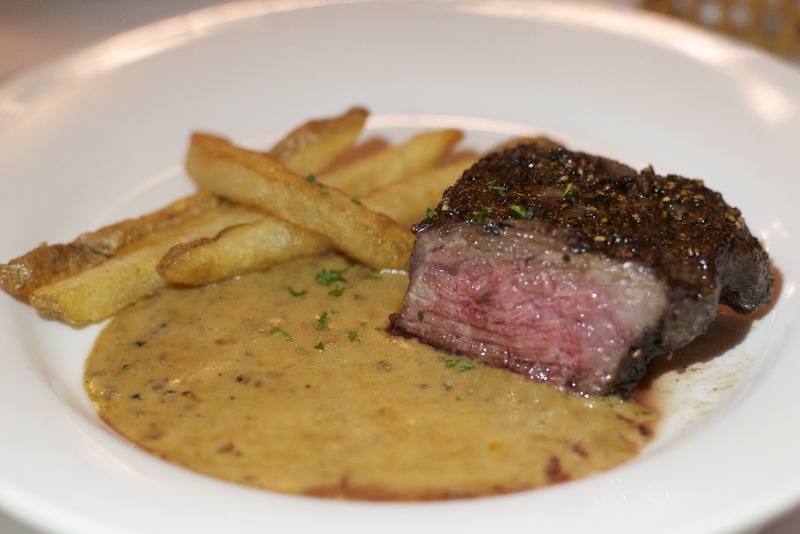 Seasoned with lots of nutmeg, this dish was voted favorite amongst a few non-cream sauce fans. It was almost sweet enough to be dessert! 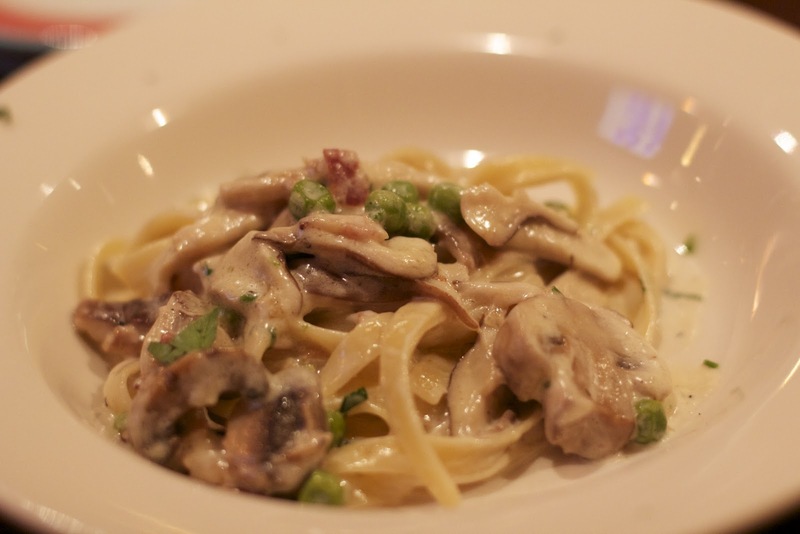 Peas, meaty wild mushrooms, and Italian bacon add lots of delicious texture to this light cream sauce. Like with the vodka sauce, the bacon adds an intense, smokey flavor. 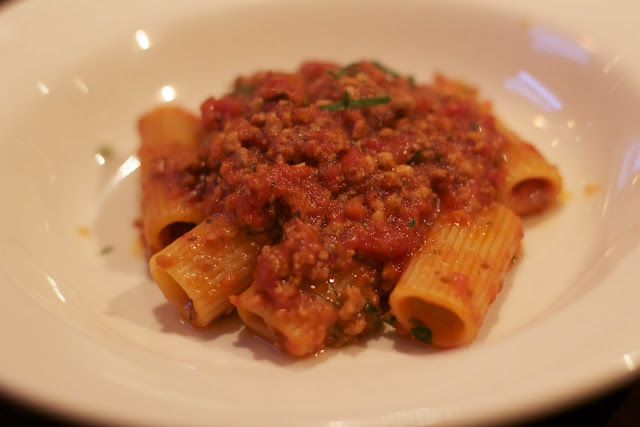 A nice hefty portion of ground veal and beef make this classic and simple tomato sauce my runner up pasta choice. And now we finally get to the pizzas! From front to back: 1/2 plain & 1/2 mushroom & pepper, garlic & pepperoni, and sausage & onions. Surprisingly, my favorite was the pepperoni! Usually I find pepperoni pizza too greasy, but the homemade pepperoni added tons of spice and flavor with none of the unnecessary grease. Alex told us the secret to his crisp pizzas are the PLUM tomatoes (eh? get it now? Plum!) that he uses, which add lots of yummy, tomato flavor without lots of juices that make a sloppy slice. Plus, the temperature controlled, gas-powered brick oven make sure that the crust comes out to the same satisfyingly snappy texture every single time. The desserts at Plum are one of the few things not made in house. Instead Alex has them made by some local pastry chefs that he knows. He allows them complete editorial freedom so the dessert menu changes frequently. 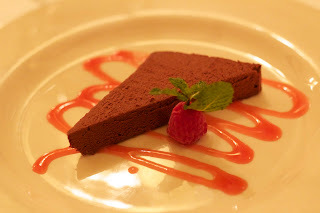 We all managed to finish this incredibly rich & decadent slice of cake despite the fact that we had just tried 4 different pastas and pieces of pizza! We also loved all the wine pairings. For a casual little pizzeria, Plum has an impressive and extensive wine list, because Alex believes you don't have to pay $60+ dollars a plate to enjoy a good wine. This makes it the perfect spot to meet up with good company. It's casual and affordable, but without sacrificing on getting some really well prepared food and a magnificent glass of wine! This name always comes up whenever the subject of dumplings is being discussed and for good reason. Tasty, tasty dumplings at a great price. We will be swinging by to pick up a batch of our own soon! HUGE cookies. Not only are we talking diameter, but height too! The result is a lot of crisp cookie outside balanced with gooey, melty, chocolately goodness on the inside. These redefined cookies for me (not exaggerating). Interestingly enough, our favorite Indian take-out place in Murray Hill is Chinese Mirch- which is actually Indian/Chinese fusion. 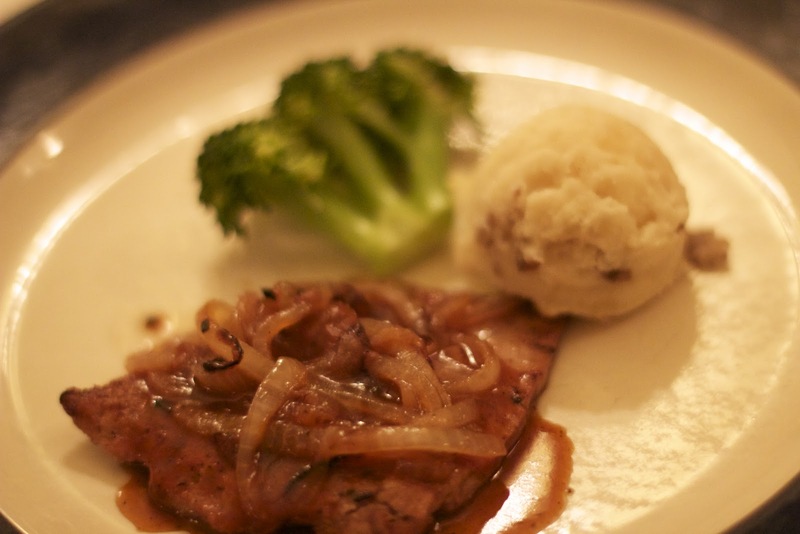 With the weather being cold, we decided to let our food come to us, and here's what showed up at our door. Crispy Okra, Gobi Manchurian, Chicken Manchurian, and Singapore Rice Noodles. We're actually still a little confused about the stuff in the middle. We checked the SeamlessWeb box to add some hot sauce, but this was a big vat of warm liquid, like a soup? So we either got a free soup, or we ate the hot sauce as a soup. Either way it was delicious and SPICY! You can also tell The Mr is coming along well in his pursuit of becoming a foodie- look at how he plated his food! Cookshop is essentially catty-corner to our office building, so I was surprised when The Mr pointed out that he'd never been. I had been a few times, but always left feeling a tad disappointed. I keep going back because I really love the ambiance of the place, so I really want to like it. Finally, my persistence paid off! The Mr. got the special which was sausage on bed of lettuce, apple, and mustard seed vinaigrette. I went with the Cookshop Mezze which is flat breads served with white bean puree, beets, yogurt, and 3 bean salad. Definitely one of those dishes where each component by itself was just OK, but when they were blended together on the flatbread they transformed. This was finally the level of food satisfaction I've been looking for from such a highly acclaimed eatery! We were invited to make our first non-museum journey to the Upper East Side to try Sel et Poivre's Tasting Menu. This delightful little bistro has been around for 22 years, so they are obviously doing something very right. It was originally run by a mother and daughter team, but when mom chose to retire, her son-in-law stepped in. It is now run by the husband and wife team of Christian & Pamela Schienle. Christian was on duty during our visit and was warm and welcoming; he obviously loves what he does and takes time to greet his diverse group of customers. This charming bistro elegantly supported diners in bow ties and cocktail dresses, as well as patrons in more casual attire, with neither seeming out of place. Fresh bread that made a satisfying crunching sound when touched, yet had a soft interior. 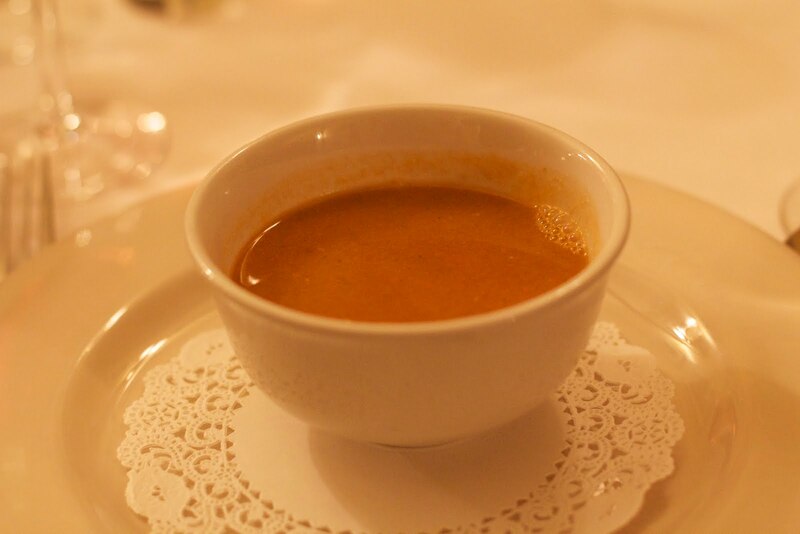 Traditional fish soup that you can flavor and texture as you wish with the accoutrements. Surprisingly curry twist to the remoulade which gave this dish a delightful twist. This is the dish I will be coming back for. I'm literally salivating just looking at the picture. 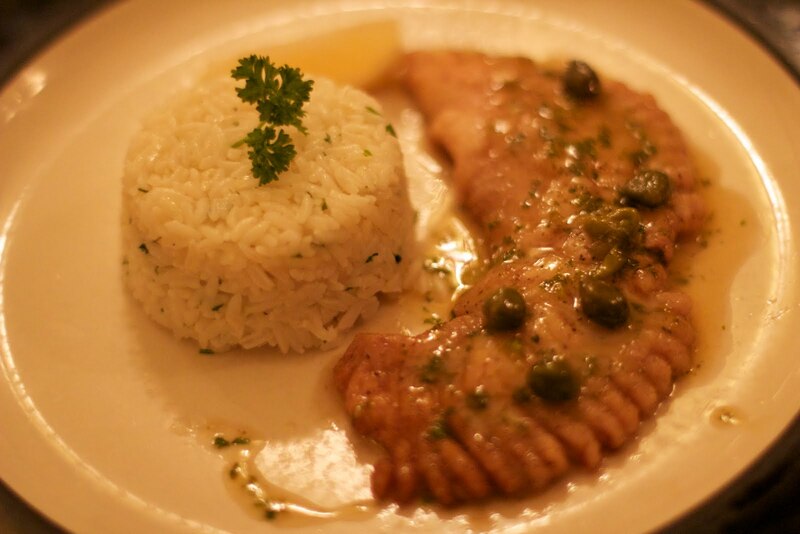 The skate fish was melt in your mouth tender and perfectly balanced with the lemon sauce, large capers, and rice. We were both nervous about seeing calves liver on the menu as this would be our first experience with non-poultry liver. We were both initially turned off by the taste, but I found that I could find a really nice mix of the sauce, onions, and potatoes which complimented it well. Still can't say I'm sold on calf liver, but if you are looking to try it, I would start here. Knowing we were a bit nervous about the calves liver, Christian graciously brought us a backup entree. No hesitation here, excellent. What a nice light way to end an amazing meal. 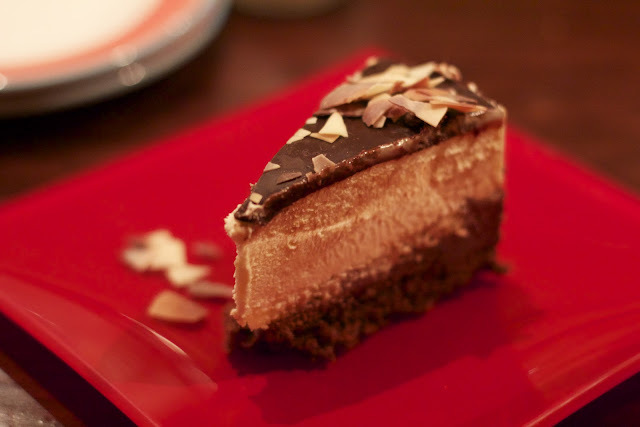 Intense and rich chocolate flavor without making us uncomfortably full. The final thing I have to mention is Christian's passion for wine. Each course was paired by a glass of wine even more delicious than the last and each perfectly complemented the dish. We were really impressed by the collection. We returned to Olives to try the popular tuna tartare and pork chops that enticed us on our last visit. But first, we had to try their signature martini (with bleu cheese stuffed olives) and apple pie old fashioned. 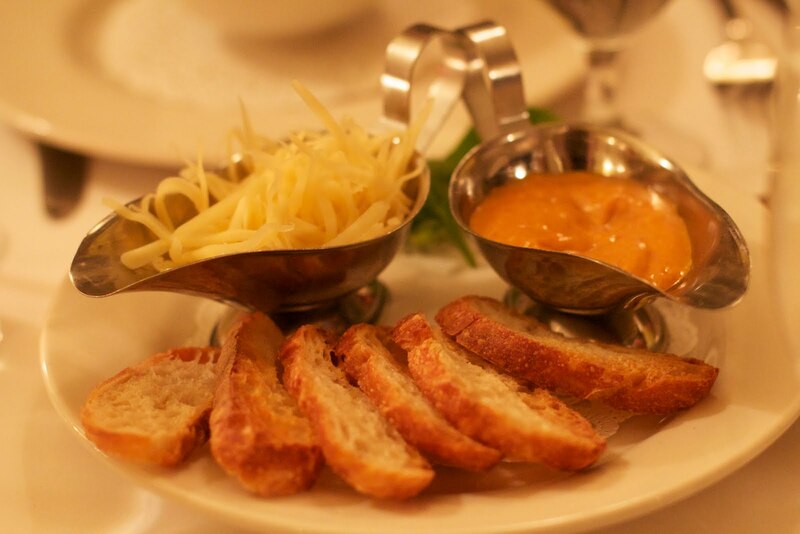 The bread basket and tampenades were every bit as delicious as we remembered. As you can see the Crispy Pork Chops, piled high with snap peas, cockles, peppers & aioli was a major hit. It tasted even better than it looked. 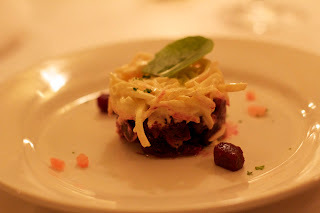 The tartare was also quite tasty and was a nice, light start to the meal. We were stuffed, so were grateful for the free mini-cupcakes they brought us to finish off the meal with a sweet taste. Overall this is one of our favorite meals. We were doing a little apartment hunting on the UWS and decided to use our Diner's Deck. 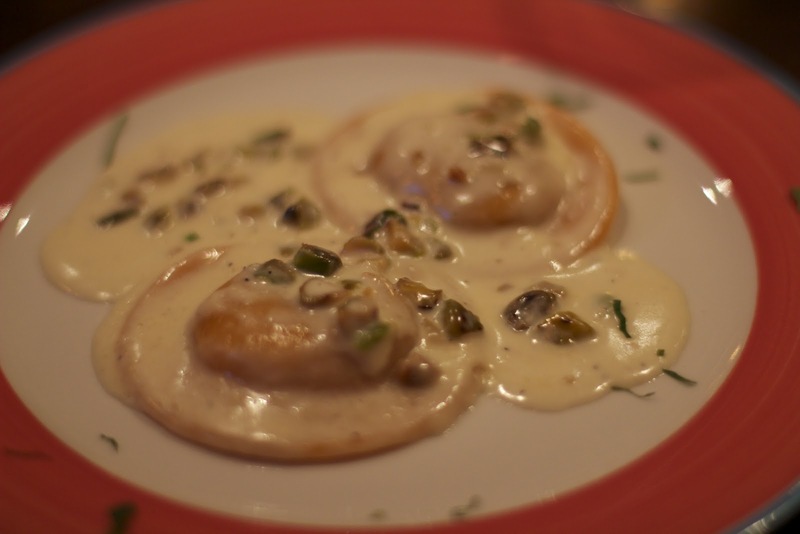 A French pistro called Picnic piqued our interest, so off we went. To my surprise and delight there was a sign outside advertising a Beatles Brunch! We walk in to a sweet bistro filled with light, but sadly there are no Beatles to be heard. About half way into the meal (and toward the end of the advertised time frame) the musicians arrive and start setting up. Oh boy, there are a lot of them, they have to clear the back half of the restaurant. We wound up hearing 2-3 songs at the end of our meal, but this group really wasn't my style, so we didn't stick around for more. As for the food? The Mr's Croque Madame was good, but I was disappointed in my Salade Nicoise. For $15 I really hope for fresher greens (these looked suspiciously bagged lettuce-like). The wait staff was great though and it was a very pleasant place to spend an afternoon. A few months ago I attempted to get some dinner with a friend at Mario Batalli's new Italian shopping & dining complex Eataly. She was especially excited having lived abroad in Italy in college. We walked through the chaos, but couldn't really get a handle on where to get ready-to-eat food without a long wait for the restaurant in the back. In the end, we got confused, gave up, and wound up going to our respective homes and eating leftovers. When I found myself needing some Italian Antipasti for a family gathering I thought perhaps Eataly would provide a better grocery shopping experience. I dragged The Mr. along because it's a pretty impressive space and needed some reinforcements. We started with an espresso at the espresso bar to give us a quick kick-in-the-pants to deal with the crowds. Aaaaand we were off. We found the fresh mozzarella, picked it up, and then were frightened off by the steep price tag. "Let's come back to that" we said, and put it back down. Then we fought through the jam-packed aisles in an attempt to find some roasted red pepper. I figured they would have some fresh somewhere, but to my surprise all they had was jarred. We were already starting to lose steam and patience. Just like trip #1 we wandered around for a bit more before throwing in the towel. In the end we wound up getting our bread, salami, tomato, mozzarella & red peppers from Whole Foods (I roasted the peppers myself in our toaster oven). Overall, my impression of Eataly is that it's trying to do two things at the same time, but without a clear division of where to shop and where to eat it becomes incredibly confusing. Perhaps it wouldn't be so bad if it wasn't so crowded. It is kind of fascinating to walk around though, if only to see the two huge aisles of pasta of every shape imaginable. For me, Eataly is an interesting place to bring out of town guests if we have a few minutes to kill. We were out and about apartment hunting and needed a quick bite to keep us fueled. We were going to just grab a sandwich from any bodega we passed, but I pulled out my iPhone and found a place nearby that had some rave reviews. How I love modern technology! If we had not been looking for it we would have never noticed it. In fact, we walked right by it at first. What we found when we walked in was a teeny European cafe stashed away. It's a small little place, but they have it stocked up with loads of fresh ingredients to make a wide variety of sandwiches and salads. The crunchy baguettes and international clientele transported us to what I imagine French cafes to be. If you are in the area and need a simple yet delicious lunch, be sure to stop in, but make sure you've got some cash because it's cash only.